Best Benchtop Planer | Which Thickness Planer is Right for You? You are here: Home / Best Benchtop Planer / Best Benchtop Planer | Which Thickness Planer is Right for You? It’s hard to agree on the best benchtop planer because everyone has different needs and budget. We feel it’s important to look at a range of models so you can make the right buying decision for your particular needs and budget. A benchtop planer is essential if you’re a woodworker, hobbyist, or carpenter. A bench top planer may not be as powerful as heavy-duty thickness planers, but then again how many of us have the budget or space for these large machines. Aside from this, portability can be important, in which case you can’t beat a benchtop planer. Typically, most benchtop planers will be able to cut up to ⅟16” at a time, some can even double this cutting depth. This means that you can achieve the same thickness abilities as a large industrial machine, it’s just going to require several passes through the machine. For most workshops and home users, this is not too much of a compromise. It’s just going to take a while longer to get the desired thickness. In this article, we’ll be looking at the following benchtop planers. When looking at this list of brands, my first observation is that it will be a contest between DeWalt and Makita as to which is the best benchtop planer. To avoid my personal prejudice from influencing your decision, I looked around to get an objective opinion from several experts. In order to make sure that you get the best information, I’ve listened to people who’ve put these machines through their paces on some of the harder woods. In the end, it’s your opinion that counts. While we all look for perfection, not everyone has the same amount to spend. There’s no point in only reviewing the machines that you wish you could have had, if only you had the cash. So we’ve compiled this selection with the different requirements of our readers in mind. Some cost more and come highly recommended by professionals who want the best that they can get. We’ve also included more affordable options that may not give the best results but still perform well – these machines offer very good value for people who simply can’t pay for the top-rated machines. This list of the best benchtop planers is aimed at allowing you to choose the best option for its price. There are two basic functions of a planer that are essential to consider, this is smoothness and accuracy. After all, we’re looking for a machine that gives you a smooth surface that requires the least amount of sanding and an accurate thickness. Other factors that may influence your decision may be, dust extraction, noise levels, power, and of course, price. All of these factors have been considered when compiling our list of the best benchtop planers. So let’s take a look at what features are important on a benchtop planer. Snipe is caused by the wood moving up or down whilst being fed into the planer causing a deeper cut on the ends. The size of the infeed and outfeed tables play a role in this as does their adjustment, most planers offer additional infeed and outfeed tables as an optional extra. A planer that automatically locks the cutter head, will help a lot to prevent snipe. A small amount of snipe is inevitable when using a machine that does automatically lock unless you’re very proficient at feeding the wood into the machine, but this can usually be removed with some light sanding. In some cases, it can be so bad that the ends of the piece have to be cut off and thrown away. Scallop is the ripple-like effect that you get as the wood moves past the cutters. Better knife speed (more cuts per inch), the amount of rollers and feed speed all help to reduce the scallop effect. A good planer can feed wood through without producing any noticeable scallop, by using several rollers. A depth gauge that is clearly marked helps you adjust the thickness of the cut more accurately. Being able to make fine adjustments to cutting depth of the knives will reduce the likelihood of tear-out and snipe. An adjustable end-stop allows you to set the minimum thickness and prevents you from cutting the wood thinner than you intend to. As with any cutting tool, being able to remove dust and wood chips as you work is a big advantage when it comes to cleaning up. Some machines have a fan that blows dust and chips away from the cutter head to improve their performance. Power is important because this will determine the depth to which a machine can cut and also the width of the wood being cut. A more powerful machine will allow you to work faster. For the purposes of this review, we’re not going to concentrate too much on power because they all have 15A (1800W) motors and therefore provide roughly the same cutting capacity. A planer is amongst the noisiest woodworking machines, so you’ll probably be working with ear protection when using the machine. However, some can be less noisy and this might affect some people’s decision. Dewalt quality planer, solid construction, fast and affordable. Powerful 15 amp, 20,000 rpm motor handles larger, deeper cuts in hardwoods. Disposable, reversible knives deliver 30% more knife life and make knife change fast and easy. Extra-long infeed and outfeed tables provide 33-1/2″ of material support. ✓ View or download the MANUAL for the DeWalt DW734. If we’re going to go with the popular opinion, the DeWalt DW734 is the winner among all of them. I suppose this is because this benchtop planer offers legendary DeWalt precision and reliability at a very affordable price. This machine gives you all the basics that allow you work efficiently and accurately without many of the bells and whistles found on more expensive alternatives. The three knife cutter moves at 10000 RPM, powered by a 20000 RPM 15A motor, resulting in 96 cuts per inch giving a really smooth finish. The knives are disposable and reversible, they’ll last about 30% longer than most others and they’re quick and easy to replace. The DeWalt DW734 can accommodate material up to 12½”. Riving is minimized thanks to the four-column carriage lock and long infeed and outfeed tables providing 32½” material support. Maximum cutting depth is ⅛” with a material removal gauge that allows you to accurately set how much you remove with each pass. The material depth capacity is 6” and there’s a thickness gauge with enlarged markings so that you can fine tune your thickness settings by turning the large turn handle at the top of the machine. A turret depth stop makes it quick and easy to return to your favorite depth. Weighing 80 LBS, it’s quite a hefty machine to lug around but provides a very stable base to work with. Carrying is made easier by the inclusion of two metal handles on either side of the machine. Though by the look of its design, it may become uncomfortable carrying the planer over longer distances, they are not soft-grip handles. You’ll need to wear hearing protection when operating a planer. I can see why the DeWalt DW734 is so popular, I don’t think any other planer in this price range can match the accuracy and ease of use that this machine offers. Two-Speed Thickness Planer Package : One of the very best benchtop planers. DEWALT knows how to make great planers. Excellent value! ✓ View or download the MANUAL for the DeWalt DW735. In my opinion, it’s a toss-up between the DeWalt DW735 and the Makita 2012NB which is the best benchtop planer. I must point out that both of these are the most expensive models in this review, so quite a few people will look past them based on the price. While quite expensive, they are not as expensive some other planers from top brands. I think they offer exceptional value for money if you’re looking for a high-end benchtop planer. Many of the technical specifications on the DeWalt DW735 match those of the DW734. It also has a maximum cutting depth of ⅛” and adjustable material depth of 6”. It also uses the same knives that rotate at 10000 RPM and has the same extra length infeed and outfeed tables. The DeWalt DW735 also has an extra large turret depth stop. Accurate, compact and smooth! A nice mix of features that you’ll love. The DeWalt DW735 has a slightly better width of 13”. It also has a longer cast aluminum base, measuring 19¾” which is much more stable than the usual fold-out 10” base. I really like the large easy to use cutting depth adjustment that allows you to make the finest adjustments accurately and easily, the material removal/depth of cut gauge is also very well marked and easy to read. Where this machine really shines, making it a cut above the rest is in its two-speed gearbox. You can choose between the normal 96 cuts per inch setting or switch to a super-fine cutter speed that provides 179 cuts per inch. Of course, at 179 cuts per inch, you’re going to have to work slower. So you can choose between optimizing speed or smoothness. The automatic four-column carriage (cutter head) lock really helps to prevent snipe. The DeWalt DW735 also has fan assisted dust and chip extraction, making it one of the cleanest machines to work with. Something else that’s really convenient, is the tool storage compartment at the top of the machine to keep all your blades and plates in one easily accessible place. This machine is quite a bit heavier than the DeWalt DW734 (92 LBS). Thankfully, the DeWalt DW735 has large soft-grip handles, making it easier to carry and won’t put as much strain on your hands. So, if you’re fine with paying a premium for one of the best benchtop planers, this machine will definitely impress. It provides superb quality for the person who’s serious about your woodworking machinery. Excellent build-quality and features for very little money. Great buy on a budget. This is a 12.5″ 15A Benchtop Thickness Planer with a sturdy Granite Table. If you’re on a limited budget this would be your best choice. WEN is known for making great products while still being very affordable. Not everyone needs a professional quality benchtop planer so be realistic about your needs before spending more than you have to. ✓ View or download the MANUAL for the WEN 6550. The Wen 6550 benchtop planer is very affordable but may lack some features of the higher priced machines. Where it can be found wanting in some respects, it has other features that you won’t find on some higher priced machines. When all is said and done, this is very good quality planer at a price that makes it incredibly attractive. It provides for a material width of 12½” and material depth of 6” with very accurate depth adjustment by using a turn handle like the others. It also has a 15A motor with similar cutting speed. So far these specs are identical to the DeWalt DW734, but from here on the similarity ends. Something many may like is the granite work table and infeed and outfeed tables. This provides a much smoother surface so the material will feed through easier. It’s also much easier to blow away bust and wood chips from the granite surface. The weight of the granite base also creates a good weight distribution as the machine has a lot of weight concentrated at the bottom. Granite is brittle so you run the risk of it chipping or even cracking but under normal use, this shouldn’t really be a problem. Despite the heavy granite base, the Wen 6550 only weighs 79 LBS and it has carry handles on either side as well as a bar across the top of the machine. The Wen has a three roller feed system, so it is pretty good at preventing scallop and you can work smoothly with little effort. One clear advantage of the Wen 6550 over the other cheaper machines is the fan assisted dust and chip extraction. So if working clean is a priority for you, the Wen may be your preferred option. Designed with many great features. Choosing between the Wen 6550 and the DeWalt DW734 will come down to personal preference, they are both quality machines from respected brands. The knives on the DeWalt will make it a little easier to prevent scallop. Otherwise, each will have to decide for themselves whether they prefer an aluminum or granite base. if dust extraction is important to you, then the Wen 6550 will be your best option among the cheaper machines. A solid mid-level benchtop planer. Powerful 15A motor capable of handling the demands of a small shop. Four column design provides excellent stability for smooth, accurate planing over many years of use. Adjustable Infeed and outfeed tables to better support long pieces and reduce snipe. Reversible dust port allows you to collect chips from the right or left side of the planer. Overload button protects your motor from damage due to overheating. This is another reasonably priced benchtop planer that comes fairly close to the more expensive models in terms of features. It has 13” width capacity and 6” depth, this is the same as the DeWalt DW 735 which is among the more expensive options. Infeed and outfeed tables length compare with the best at 13”, they are made from durable synthetic rubber, I prefer aluminum but the synthetic material still seems to be of good quality. This does help when it comes to weight reduction and the Delta only weighs 58 LBS, making it very portable for a machine of this size. A double carry bar across the top makes it easy to lift and carry. Reversible dust port allows you to collect chips from the right or left side of planer. The material depth adjustment is very accurate with detailed markings. You only have a maximum cutting depth of ³/32” so if you’re working with very uneven wood, it may take a number runs through the machine to get a flat square surface. It has two disposable knives that are very easy to change. The two polyurethane rollers give it a reasonable amount of grip. This machine won’t make it as easy to control snipe and scallop as the more expensive options. The four column design I nice to see, offering a much smoother and more accurate cut. It has a dust removal port (without the assistance of a fan). This port is reversible so you can attach you extractor pipe to whichever side is more convenient. A handy tool storage compartment is also a plus. The Delta Power Tools is a well-made planer and gives you a lot for a good price. If you’re going to be transporting the machine on a regular basis, the lightweight design will be a big advantage. Exceptional build quality as you would expect from a Makita product. ✓ View or download the MANUAL or PARTS LIST for the Makita 2012NB. The Makita 2012NB costs about the same as the DeWalt DW735 and is most definitely in the same class. It’s a fantastic machine and shares some of the great features that separate these two from the rest. It has the automatic carriage lock that isn’t found on any of the cheaper machines. Like the DeWalt 735, the Makita 2012NB will automatically lock down on the material as you begin to feed it through. This ensures that the wood enters machine perfectly flat and there’s virtually no chance of snipe. More expensive than other planers on the list but worth every penny. The infeed and outfeed tables are also about the best measuring just over 30” in length. Material width is 12” and depth is adjustable to 6” with a very clearly marked depth gauge for perfect accuracy. The depth adjustment is easy to use with a very accurate control handle and it has an adjustable depth stop. The dust hood collector is an optional extra on this model, which puts it a slight disadvantage to DeWalt alternative which has a fan assisted dust collector built in. Where it scores higher points than the DeWalt is its lightweight design (61.9 LBS) and exceptionally low noise levels at 83 dB – this is just below health safety requirements for wearing ear protection. The carry handles on each side of the machine make it easy and comfortable to transport. The double sided knives are easy to replace and remain sharp for a good length of time. The machine uses two knives and rotation speed is 8500 RPM. It also has a detachable tool box for convenient storage. As one would expect from Makita the design and quality of the 2012NB is of the highest standard. Paying extra for a machine of this caliber is, in my opinion, money well spent. Choosing between the Makita 21012NB and the DeWalt DW735 will be a tough call. What’s the Best Benchtop Planer? At the top of the price range, we have the DeWalt DW735 and Makita 2012NB and these machines are for people who are serious about quality. The main feature that sets these two apart from the rest is the automatic locking carriage, which is the only sure way of preventing snipe. I see this as a big benefit. The Makita is lighter and quieter which plays in its favor. But then again, the DeWalt has the two-speed gearbox and built fan assisted dust extraction. So one would have to weigh these pros and cons against one another and decide which is better for your needs. The DeWalt DW734 stands alone as being slightly more expensive than the other cheaper models but quite a bit cheaper than the two top machines. With the exception of the automatic lock on the carriage, dust extraction, and the dual speed on the DeWalt 735, this planer is very close to the top two in its ability to give you a smooth and accurate finish. 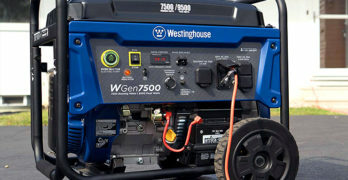 The Wen 6550 is the winner as far the price goes, being the cheapest of the lot. While it may be cheaper it’s still a good quality machine and matches quite closely to the more expensive options, even offering a fan assisted dust extraction unit. The Delta Power Tools 22-555 falls neatly in the middle of the price range and is quite similar to the Wen 6550 when it comes to features and working ability. Where the Delta machine is a clear winner is in the weight department, being the lightest of them all. This can be of great importance to people who are going to be transporting the machine regularly.